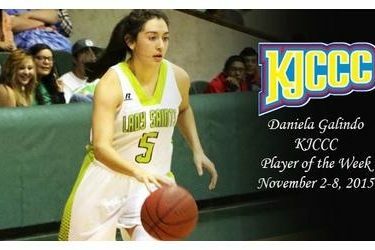 It is safe to say that the first week of November of 2015 will be one that Seward County sophomore Daniela Galindo will not soon forget. Following the Lady Saints best win of their early season schedule on Friday against Gillette, she broke a pair of school records in a blowout 126-36 win over University of the Southwest on Saturday and on Monday, the guard from tiny Shattuck, Oklahoma was named the KJCCC Player of the Week for her work. Daniela Galindo put on one of the finest performances in NJCAA history Saturday night for the Seward County Lady Saints, shattering a school record with 50 points while also breaking the school’s all-time mark for three pointers made in a game with 10. Somehow Galindo did so without being selfish as well. Not only was she able to score her 50 points in just 23 minutes of action, but she also had six assists in the game, adding another 13 points to the board for the Lady Saints. In the Lady Saints first game of the weekend, Galindo scored 16 points and had seven steals in a win over unbeaten Gillette. On the week, Galindo averaged 33 points per game, shooting 56% from the field and 48% from the three point line. Galindo and the Lady Saints will face their stiffest test of the 2015 season in their next outing when they travel to Midland, Texas to take on #23 Odessa and #20 Midland Friday and Saturday in Midland’s Tip Off Classic in the Lone Star State.